With more and more toxins and nasty chemicals making their way into conventional cleaning, bath, and body care products, I’m proud to support a day that celebrates the benefits and necessity of natural products. On March 24—Natural Products Day—our friends at the National Products Association (NPA) and industry leaders came together in Washington, D.C. to educate and discuss the important role of natural products in keeping our society healthy. But if you’re like me, you care as much about what you put on your body as what you put in it. Eating clean and using clean products is a day-to-day commitment. So let’s make Natural Products Day an everyday affair. 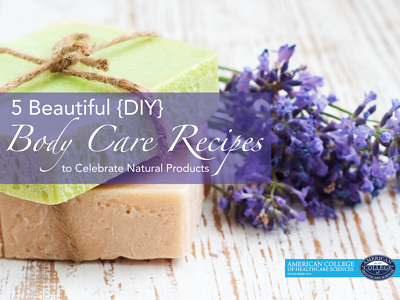 Here are my 5 favorite beautiful and easy DIY body care recipes to celebrate natural products all year long. This mixture is most effective and just lovely when used in the shower. Use small handfuls of your natural sugar or salt scrub and rub over the body in brisk circular motions. I love to focus on acupressure points: lymph nodes, collarbone, ear lobes, the base of the neck, and even around the nostrils (gently). There is also one just under the knee on the outside of the leg that supports the gallbladder. This is my go to “owie” herbal ointment recipe. Use freshly dried herbs if possible (nothing over 2 years old) and grind them finely. Cover them with an extra virgin, cold-pressed olive oil in a tightly capped preserving jar. Allow it to sit in a warm place (but not direct sunlight) for 10 to 14 days. Shake the oil mixture twice a day, ensuring that all the herbs are covered in the oil. Top it up if necessary. After steeping for two weeks, strain out the oil using butter muslin or cheesecloth and squeeze the herbs to ensure as much of the oil is released as possible. Place this oil in a saucepan over a water bath, or in a double boiler, and bring it to a low temperature that will melt beeswax. For every cup of oil, add one to two ounces of grated beeswax depending on the consistency required. At this point you can use the “spoon test” to gauge the consistency of the ointment. Take one teaspoon of the mixture and place it in the refrigerator for five minutes. The consistency after this time will indicate the hardness of the final product. Add more beeswax to harden or more oil to soften. Mix all ingredients. Massage this natural emollient hair oil into hair and scalp twice a week in the evening and leave on all night. Wash and condition your hair as usual the next morning for glowing and moisturized hair. Mix all the ingredients to a smooth texture. Apply to a clean face, avoiding the area around the eyes. Lie down with your feet up to improve the circulation to the facial area. Leave on until dry and wash off with warm water. Splash the face with a mild toner to tighten pores. Blend all ingredients. Add ground oatmeal, brewer’s yeast, or fuller’s earth if the mixture is too wet. Apply to the face, avoiding the area around the eyes. Do not leave the mask on your skin for more than 10 minutes, or if the mask starts to sting, particularly on sensitive skin, as the papaya has a powerful enzyme action that may leave the face raw. Finish by splashing the face with lukewarm water. I hope you enjoy these recipes—and please let me know how they turn out for you. Then share with me how you spent your Natural Products Day 2015 in the comments!